Stacy Steponate Greenberg, Pursuitist contributor and founder of the The Overhead Compartment series, has announced the upcoming release of “MVP,” a new children’s book published by Simon & Schuster. 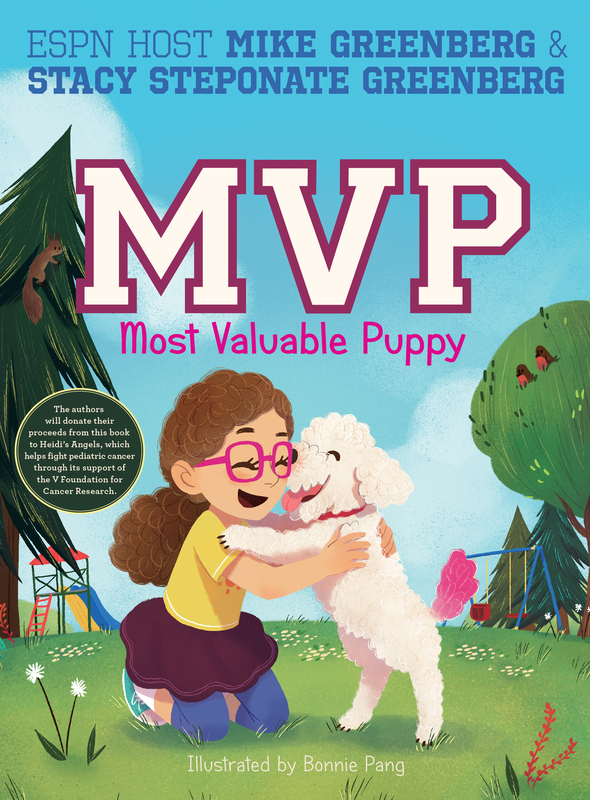 Pre-order now: “MVP, Most Valuable Puppy” written by Mike Greenberg and Stacy Steponate Greenberg, and charmingly illustrated by Bonnie Pang. Phoebe is a dog with a pink tail. She lives with her family—the Man in the Box, the Lady who Feeds Her, the Baby, and her sister the Girl with Curly Hair. Phoebe’s favorite time of day is when she and her sister go to the park and play. But today things are a different. Can Phoebe convince her best friend to try something new? And can she show her that sometimes it’s okay not to be perfect? Phoebe and her sister learn that no matter what happens and no matter how many mistakes you make, your family will always be there for you. Also, pre-order “MVP” for a wonderful cause. In 2013, Mike and Stacy created the Heidi’s Angels Foundation to fund cancer research. The authors will donate their proceeds from this book to Heidi’s Angels, which helps fight pediatric cancer through its support of The V Foundation For Cancer Research.